Tomorrow it is IPv6-day again. The day to make the world aware of a new version of the protocol that makes the internet possible. IPv4 (now) and IPv6 (now and future) make it possible to connect devices to the internet. With the original design of the net every device received a unique address to communicate with other devices. When the internet grew the demand of addresses grew as well. We are now in the situation that there are no more free addresses, so new devices can’t connect to the net, without recycling existing addresses. That doesn’t sound too bad at the moment, but will become a big problem when there are really no more free addresses available. 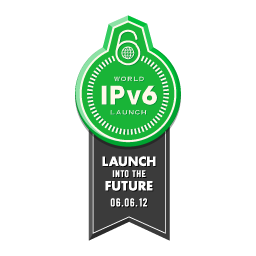 6th of June is chosen as the World IPv6-day. Some big sites use the day to open their infrastructure to the public to see what the impact is of IPv6. Others give information and some will use it as a moment for marketing. When you’re a subscriber of the ISP XS4ALL in The Netherlands, you most likely have the possibility to be prepared for the future and get a native IPv6-address. Read more about that here. You also can contact your own provider and ask how far they are with the implementation of IPv6 on their network. What’s in it for me? Well, to be honest, there is nothing in it for you. Or you want to see a dancing turtle. When it’s dancing, you’re IPv6 connected. But that’s the great thing, the internet should just work. And all the testers make sure that in the end vendors of consumer equipment, the providers, the websites and the users in the end have a seamless user experience with the old internet and the new. ← Previous Previous post: Spring!